As I mentioned in a previous post, I have been meaning to unbox the majority of my Benefit Boxed Powders, so I figured I'd do a post on it. I didn't come to this decision lightly. I often cringe at the thought of depotting something that's fairly pretty to look at -- mainly because 50% of the price tag is packaging, let's be honest. Alas, now that the novelty of these boxes has worn off and I'm left jaded by their bulkiness, I've decided to dismantle them and place them in a new, more space-friendly home. 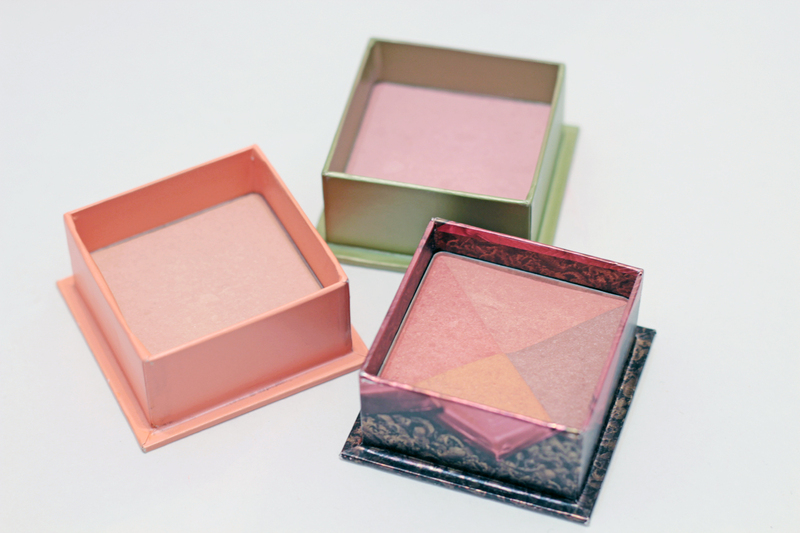 Plus, I've forgotten how pretty these powders actually are because they're hidden in this packaging. 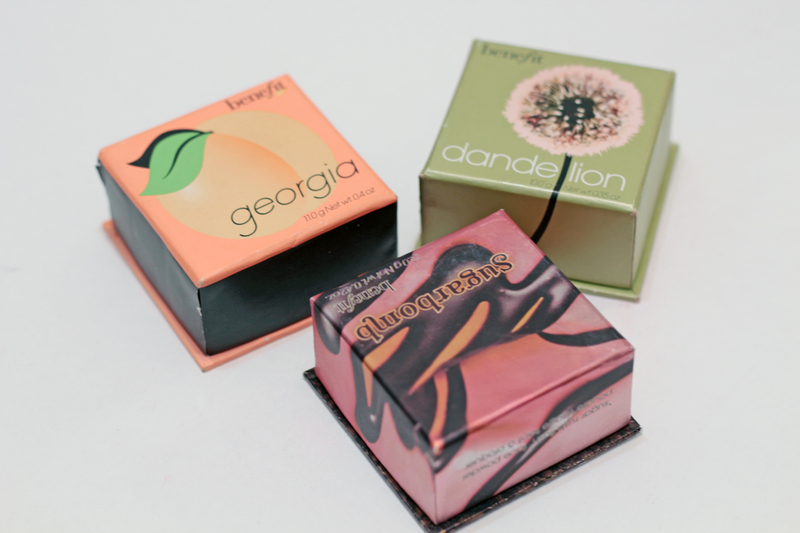 To start, I am deboxing Benefit's Dandelion, Georgia, and Sugarbomb. It's actually quite easy to do, you just have to be a little careful. Specifically when cutting the box to pop out the pan. Benefit doesn't give much leeway, so be gentle cutting the sides or you may crack the powder. As you can see, I shaved a little off the corner of Sugarbomb. My tip? Just snip the tops of all four corners and then use some muscle to tear the corners apart. Once you get the pan out, you'll see layers of cardboard cushioning the bottom. It makes the amount of product look quite deceiving. Just keep peeling back the cardboard -- like layers of an onion -- until you hit pan. Most of the pans aren't magnetized, so you may have to stick a magnet to the pan to get it to stay in a palette. I used a Sharpie to keep track of the names. Et voilà! 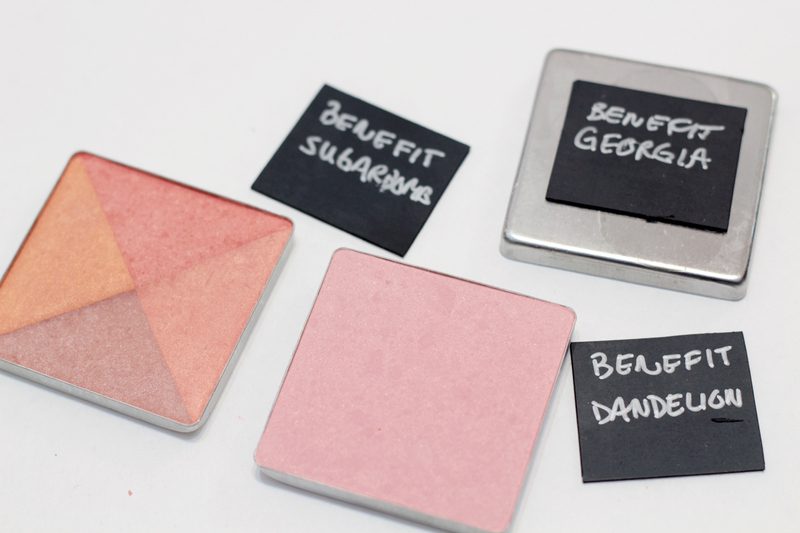 Now, just stick them in your palette of choice. I keep mine in the new MAC palettes. I actually think that they almost look better deboxed! I should do the same, they seriously are way too bulky! 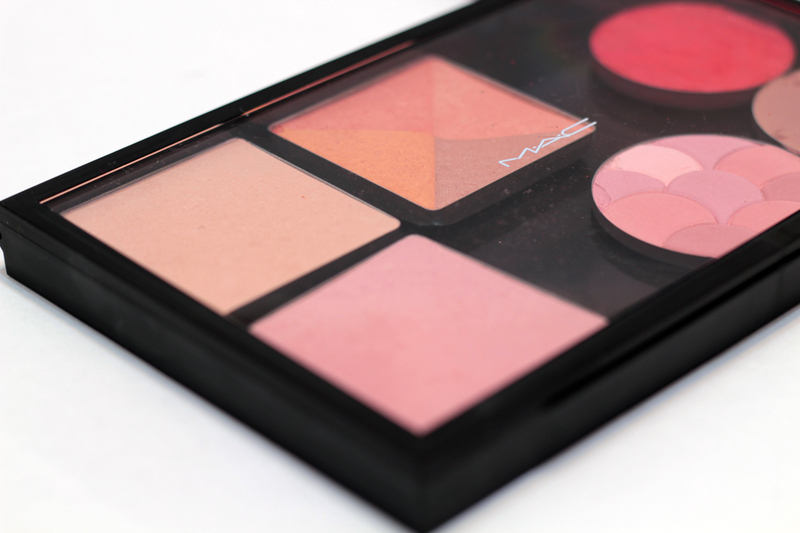 It looks so nice in the MAC palette though! 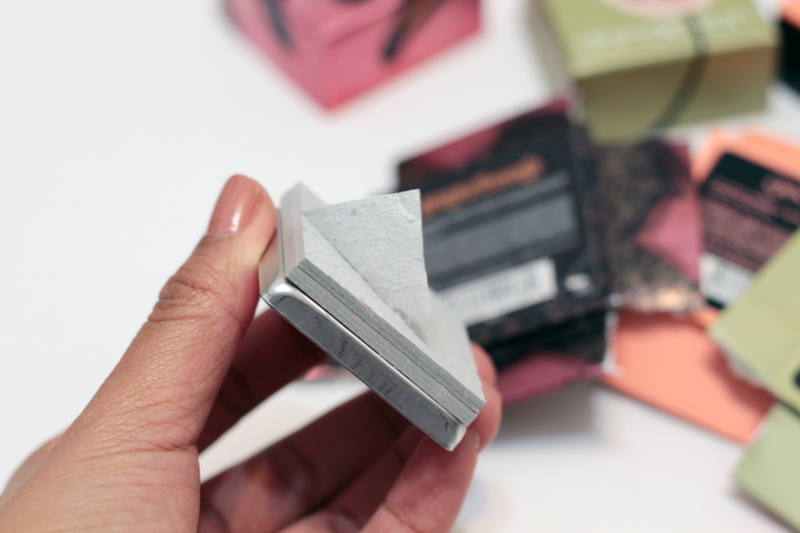 I agree -- the crystal clear covers of the new palettes seem to make depotted products so enticing. I know! I was surprised, too! Very deceiving! 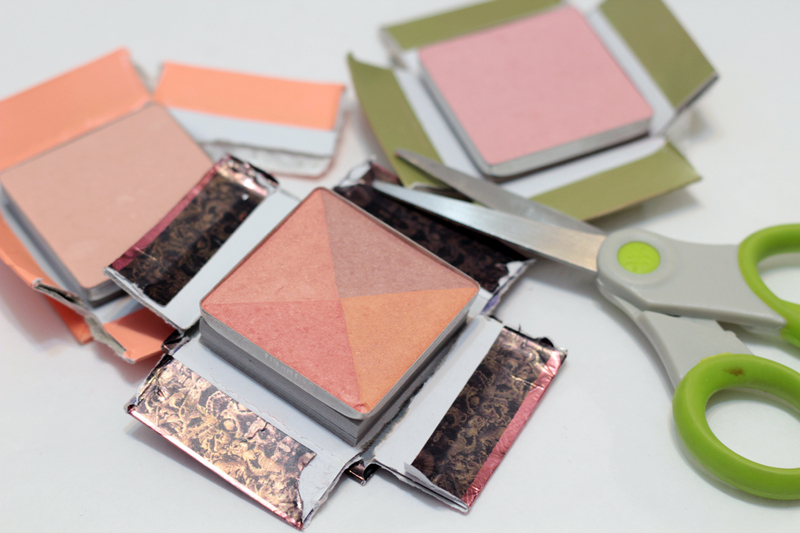 I think I might do this with my Hard Candy boxed blushes. I never reach for them because they are in the back of the drawer because the packaging is so bulky. i have to say i really, really don;t like the benefit boxes because they are so bulky! there is only so much room in my makeup bag.